With the iPhone 6, Apple has finally produced a decent-sized smartphone. If you own an iPhone 5 or even a 5s, the upgrade from a 4-inch to a 4.7-inch display alone makes the iPhone 6 worthy of consideration. But it’s not just the display that will make iPhone fans happy. You'll appreciate the incredibly sleek, rounded design, improvements in the camera and keyboard, NFC for tap-to-pay mobile payments and easier Bluetooth pairing. Even with all these improvements, the iPhone 6 to just about on par with top-of-the-line 5-inch Android phones like the HTC One M8 and Samsung Galaxy S5. 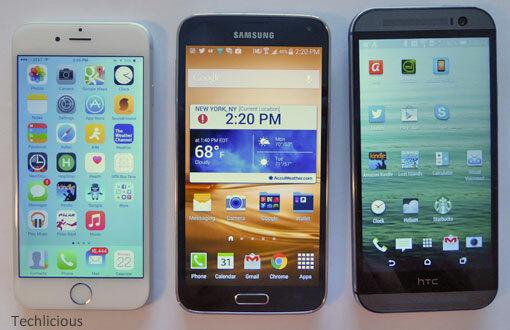 There’s no killer feature to lure currently satisfied Android users to the iPhone 6. Still, the iPhone 6 is a beautiful smartphone that will delight iPhone fans and could draw some Android users who've stayed away from the iPhone purely because of its smaller display. The iPhone 6 boasts the look and feel of a premium smartphone. The beautifully crafted, anodized aluminum and steel body is a scant 6.9mm thick, making it noticeably thinner than the Galaxy S5 (8.1mm), the HTC One M8 (9.35mm) and the iPhone 5s (7.6mm). The iPhone 6’s rounded edges make it comfortable to hold without a case, unlike the iPhone 5s with its more angular edges that dig into your hand. In extended use, though, you'll find the iPhone 6 to be slippery—just as slippery as the iPhone 5s (and the HTC One M8). And with its larger size and more rounded edges, the iPhone 6 actually feels less secure in your hand than the iPhone 5s. That means you'll probably end up using a case, undoing much of the design aesthetic. The iPhone 6's buttons feel solid and are well placed for easy access. The power button has moved from the top (on the iPhone 5s) to the side. The Home button doubles as a fingerprint reader, as it did with the iPhone 5s. Compared to the Samsung Galaxy S5’s fingerprint reader, the iPhone 6’s reader is much easier to use. The iPhone 6 has a 4.7-inch IPS LED-backlit, LCD Retina HD display. This gives it the same pixel density as the iPhone 5s (326ppi), but less than that of the HTC One M8 5-inch display (441ppi), the Galaxy S5 5.1-inch Super AMOLED display (432ppi) or even the Apple 6 Plus’s Retina HD display (401ppi). Of course, comparing these two devices makes obvious that Samsung has been able to pack a 5.1-inch display into a body about the same size as the iPhone 6. The Galaxy S5 measures 142 x 72.5 x 8.1 mm while the iPhone 6 measures 138.1 x 67 x 6.9 mm. When viewed next to the HTC One M8 the iPhone 6 compares favorably in quality. Next to the Galaxy S5’s Super AMOLED display, the colors on the iPhone 6 pop less but look more accurate. 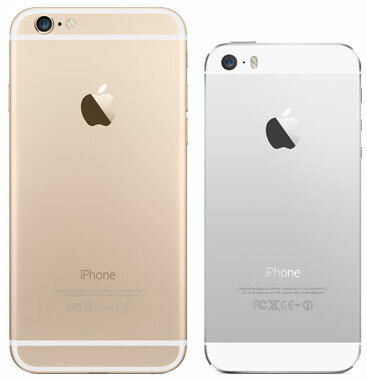 The iPhone 5 and 5s have a lower contrast ratio (800:1) than the iPhone 6 (1400:1). When viewed side by side, the iPhone 6 looks slightly warmer, but the difference in contrast was hardly perceptible. Apple still has a mono speaker in the iPhone 6, the same as the iPhone 5s. The best sound quality can still be found on the HTC One M8, with its widely spaced stereo speakers. Apple choose to stick with an 8-megapixel camera for the iPhone 6, lower than the 16 megapixels on the Galaxy S5 and the 13 megapixels on the LG G3. However, more pixels don't always (or even usually) make for a better camera. The iPhone 6 still has one of the best cameras found on a smartphone. One of the most impressive new features of the iPhone 6 is phase detection autofocus, an ultra-fast type of autofocus usually found on high-end point-and-shoot and DSLR cameras. There's no more waiting for the camera to focus like you did with the iPhone 5s, which means faster photo shooting. The iPhone 6 also includes what Apple calls “improved face detection” (as opposed to "regular" face detection on the 5s), as well as the best-shot and burst modes found on many Android smartphone cameras. Photos taken with the iPhone 6 contain deeper blacks and brighter, truer colors than photos from the iPhone 5s. The iPhone 6 flash no longer bleaches out the center of photos like the 5s did, and the new phase detection focus does a better job keeping objects in focus in low-light situations. The front-facing FaceTime camera gets a performance boost as well, with a faster f/2.2 lens for better low-light performance, improved face detection and a burst mode. On the video side, Apple has bumped the iPhone 6’s features to include continuous autofocus and a slo-mo video mode at 240fps (twice as many frames per second as the iPhone 5s) and 1080p HD recording at 60fps and 30fps. Apple claims a 25% boost in overall processing speed with the iPhone 6 and, in testing the iPhone 6 Plus (which has the same chip as the iPhone 6), everything does work faster than on the iPhone 5s. Depending on the app, boot times were 1 to 3 seconds faster, as were Web page loading speeds. A couple of keyboard improvements come with iOS 8 for the iPhone 6. Next-word predictions appear at the top of the keyboard, so you don’t have to type every word. It works best for short, common sentences like “Where are you?” or “I’m running late.” Plus, the larger keyboard is easier to type on. Even better, you finally have the option of replacing the default keyboard with a third-party option. I’m hoping for a Swype-style keyboard that lets me drag a finger from letter to letter or at least something with a number row at the top. Touch ID, which is the best implementation of an integrated fingerprint reader to date, makes security simple, just as it did for the iPhone 5s. This time, it'll be used for Apple’s new mobile wallet, Apple Pay, which may revolutionize mobile payments when it’s released next month. Having already enjoyed using another NFC-based mobile wallet called Softcard on my Galaxy S5 for the last few months, I'm looking forward to trying Apple’s version. For ore details on iOS 8 features and improvements, read our Need-to-Know Guide for Apple iOS 8. The next-generation M motion processor has also received a performance boost and a new sensor to measure elevation through changes in barometric pressure. Apple delivers a nice bump in storage options with the iPhone 6. You'll still get 16BG with the entry-level model, which isn't much given that iOS 8 takes up about 4GB. But the mid-range model now comes with 64GB (up from 32GB for the iPhone 5s mid-range model) and there’s a whopping 128GB option for media junkies. The iPhone 5s has notoriously bad battery life, so I was curious to see how the iPhone 6 would fare. This weekend I spent hours testing the phone, and when I wasn't using it, my sons were giving it a workout playing games. I was pleased to find that the battery lasted all day. 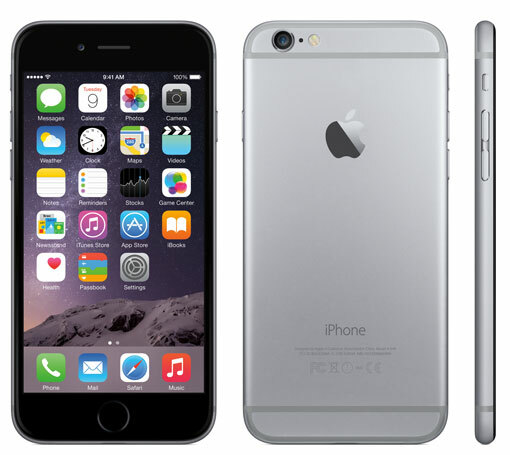 Like the iPhone 5s, the iPhone 6 is available in space gray, silver and gold. Carriers are offering great deals through September 30th for trading in your old iPhone that can cut the subsidized price to $0. As of now, carriers are citing shipment delays of one to eight weeks. Call ahead to make sure the store you select has them in stock, or order online. Upgrading to the iPhone 6 is a no-brainer if you own an iPhone 4, 4S or 5. The larger display alone is well worth the upgrade. You'll also enjoy the new camera features that make the already-good iPhone camera even better, as well as the motion sensor for health tracking and much improved battery life. If you have an iPhone 5s, the choice is a harder call unless your phone is up for an upgrade. If you've been happy with your Android phone, stick with Android. The iPhone 6 doesn't bring any killer features that you’ll be missing out on with a Galaxy S5 or other flagship Android phone. 1. The ecosystem and App quality on the iPhone. As you say, people with iPhones will definitely want the newer iPhones. Those with Android will have to think about switching platforms which can be costly if a lot of Apps are purchased. I work with a lot of businesses so I stress the security to them over the open Android platform. iOS is more locked down and secure by default than Android. However, the vast majority of malware on Android is happening overseas, and mostly through third-party download sites. For the typical US-based Android user, the likelihood of encountering malware is very small. And there are plenty of free, high-quality malware apps that can help mitigate that risk. It’s not clear that the celeb leaks are not Apple’s issue. While details of how the photos were obtained are still sketchy, it appears that hackers were able to gain access to the accounts through brute force guessing, either because Apple didn’t have login attempt limitations or they made the process too easy to guess/recover passwords. Apple’s murky denial in the matter was not reassuring. Also, iOS encrypts all data on the device so that when it is sold or stolen, the data is not accessible without the keys. Android just formats the device which we all know a format can be reversed with undelete programs. All platforms have their shortcomings. I use Android and iOS and iOS has been more stable. Saying a problem is overseas I don’t think works these days. In a matter of hours it can be in the US. Phishing attempts can trick someone into purchasing from a fake app store. Android has many AV and antimalware programs. iOS has few to none and the highest amount of malware by far is on Android. I think people should just buy what is cheap or what looks pretty, but should consult their IT professional to make sure they have the right product and the right protection in place. Thanks for your point of view. I like to hear and use both sides to stay informed. What we’ve seen from discussions with the AV vendors (who like to brag about their exploits at uncovering Android malware) is that a large number of exploits are based on premium SMS messaging scams that won’t happen in the US because of different laws/policies with cell phone billing (brought on by past cramming scams). In fact, while we get many press releases from the AV folks, it’s rare that we see an issue that has a realistic enough chance of hitting the US that we elect to write about it. There’s also a cultural difference between the US and other countries in terms of app store usage. Whether because of language issues, lack of sophistication or a greater desire to seek out pirated content, users overseas (especially Asia, Middle East and Eastern Europe) are far more likely to use third-party app downloads. This Forbes article has some stats on it: http://www.forbes.com/sites/gordonkelly/2014/03/24/report-97-of-mobile-malware-is-on-android-this-is-the-easy-way-you-stay-safe/. Android security prevents downloads from outside the Play store by default, users would have to manually change that to purchase from a fake app store through a phishing scam. You actually can encrypt Android through the security settings, but it’s not on by default (apparently this will change in the new Android L version coming out next month). Android requires a six-digit password to unencrypt. I think iOS would only requires a four-digit password? Also, not all data on iOS is actually encrypted and some have found means to bypass the lockout mechanisms, including law enforcement: http://www.zdziarski.com/blog/?p=2149. What’s the net-net? We’re on the same page that all platforms have their shortcomings. For the average consumer, following basic best practices regarding using a lock screen, secure passwords and not visiting sketchy app stores will go a long way towards keeping them safe. And thank you! I greatly appreciate these conversations, too - I always learn something new researching these questions. You always seem to forget the wonderful Windows phones. I have enjoyed my 6 inch Nokia 1520 for 10 months, a LONG time before the Apple 🍎 newcomers. We have the best cameras, the best online help, and just possibly the best sound. True, but Windows only has 2.5% of the global market share. It would be nice if it had roughly 1/3 so that we had 3 platforms evenly competing, but as with most things dominant players emerge. MS was late to the game. Ballmer laughed at the iPhone which was a mistake and now MS has a huge hurdle to et bak into the game. Hey Suzanne, I recently checked your Xperia Z3v review and now wondering around iPhone 6. Please let me know which particular phone is best for now? Since Xperia Z3v can support PS controller so its attracting me but again iPhone 6 is a better competitor.. Clear my doubts please..